Poster presentation at the International Sustainability Transition Conference in Gothenborg, Sweden, IST 2017. Topic: The Revival of Resilient Mountain Communities. What constitutes a new model of Alpine Urbanism? The successful transition of Ostana, Piedmont, Italy. 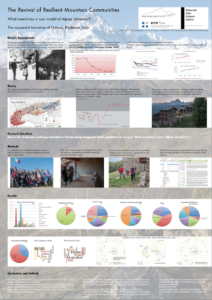 This is based on work done by USI Master in International Tourism students and MonViso Institute intern Giulia Gervasini. We are keen to engage in international discussions on how communities can rebuild their adaptive and innovative capacities (resilience) to interconnected environmental changes. Ostana is a positive example.